Tightwad: Impress people with fricos! Heat the oven to 375 degrees. Cover two large baking pans with parchment. Combine your ingredients. Sprinkle 2 tablespoons of the mixture to form 4” rounds, leaving 2” between each round. 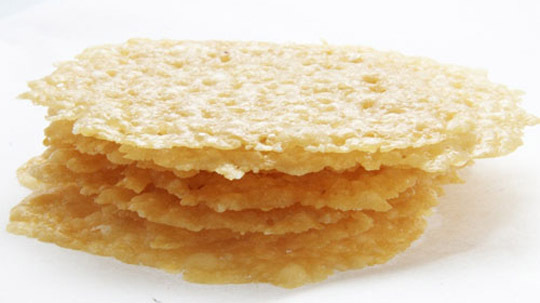 Bake each sheet one at a time until the crisps begin to colour (between 6 to 8 minutes). Don’t let them go past that or the cheese will go bitter. Use a spatula to lift the edges and loosen them from the parchment. Immediately lay them over a rolling pin or the side of a bottle to give them their curved shape. The crisps will store in an airtight container for up to two days, but who are we kidding here………… they may last two minutes!